As we come to the end of the year it’s a good time to reflect so this will be the first in a series of blogs doing just that and I’ll try to tie them in with some other advice where-ever I can. Most of the injuries on this list can’t be prevented by training better or doing specific exercises but it does go to show that you wear the correct gear to exercise in. Nr 2 on the list as compiled by the ARC, proves my point. You can see the video here and I’m sure you can immediately think of a way of preventing injuries like this. I have always thought it was odd that someone standing 20 meters, 60 feet, from a guy swinging a big bat at a ball has nothing to protect his ears and temple areas but a baseball cap. Man’s first instinct when they see an object flying towards them at 100mph+ is to turn away which means the temple area is exposed. To not protect this properly is simply insane. If the batter wears a helmet to protect himself, why on earth isn’t the pitcher wearing something? The same goes for Mark Staal’s injury, also on the ARC list. You can almost imagine the pain Mark must have been going through and he could have lost his eyesight permanently. The NHL PA stepped up and made eye protection mandatory. Again, it shows you that the right gear is important for professional athletes and the same goes for you in the gym or those of you exercising outdoors. Here are just a couple of things to look out for. I don’t care if you love your old trainers, throw them out. 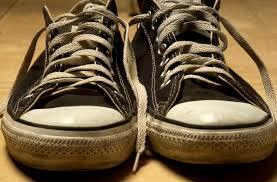 Wearing the wrong shoes when exercising will cause foot or joint problems in the long run. When running is can cause blisters, tendonitis, black toenails, muscle cramps and strains. When squatting poor shoes can mess up your posture as weak support can lead to your knees coming out of alignment. The right sports-bra is also vital exercise gear for women. Ladies; wearing a non-supportive tanktop or sports-bra will also cause issues when vigorously exercising. Obviously it can cause pain and general discomfort but you could actually be ripping tissue and permanently stretching the Cooper’s ligaments, giving you droopy breasts. If you happen to have larger breasts you can cause back and neck problems. In short; spend a few quid on a proper sports-bra. Please, for the love of everything Holy, wear proper gym attire! Wearing Baggy pants when coming in for a spin-class is just not safe as they could get stuck in the wheel mechanism. On the other hand don’t wear too tight clothing either. Wear what fits, not what you hope to fit into in a few month’s time. 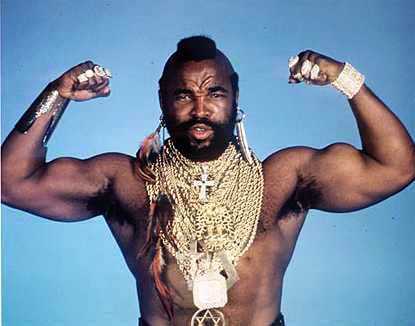 I pity the fool who wears jewellery in the gym! I always make my clients take off rings and chains etc before exercise. Jewellery might be nice but has no place in the gym. Why would you wear an expensive watch in the gym and why would you think it would survive a kettlebell session? I don’t want to see long chains bouncing up and down whilst you run and definitely don’t want a loose fitting ring cutting into your fingers whilst we’re lifting big weights. Just take them off, worry about looking pretty after we’re done. P.S. Many thanks to Mario Trucillo, Medical Editor at the American Recall Center, for getting in touch and allowing me to use his blog post. Their Health Highlights are well worth a read. This entry was posted on 16/12/2013 by Peter @ Castlepersonaltraining.com and tagged advice, David Lloyd, Edinburgh, Exercise, gym clothing, harbour, newhaven, Nutrition, personal trainer, prevention, sports injuries, tips.